Retail units at Stead's Place have been boarded up as Drum gets the building ready for redevelopment. Campaigners are urging the developers behind a rejected £50m development to reopen boarded up shops and businesses on Leith Walk. Save Leith Walk, with cross- party political support, have once again written to Drum Property Group requesting vacant units at Stead’s Place are brought back to life for the benefit of the community. Drum’s plans to build a multi-storey building consisting of 471 student room accommodation, a 56-bedroom hotel, 53 affordable flats, a café as well as business and retail units was unanimously turned down by councillors in January. The firm has yet to reveal what its next move will be, with potential options being appealing the decision to the Scottish Government or going back to the council with alternative designs. Tenants have not had their contracts renewed by Drum as they prepare the whole site for redevelopment. It has meant the Art Deco sandstone building is largely boarded up empty units, with Leith Depot being the last business to close its doors in October. Now the plans have been rejected, Save Leith Walk has called on Drum to reopen the empty units and allow businesses who are due to move out later this year to extend their stay. The letter signed by community councillors, politicians and local business owners voices concern that the empty shops are wasting valuable space which could be used by community groups and independent traders. 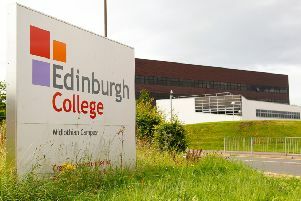 The letter continues: “We would hope that both Drum, as a responsible developer with a significant financial stake in our community, and the University of Edinburgh, Drum’s client, will consider allowing the block to be used and therefore bring back what has been taken away from us. “As the vision for the proposed new development, incorporating the existing building is yet to be decided, it is a reasonable request that you respect the wishes of the local community in the interim period. The plans have been subject to one of the biggest development dramas in the Capital in recent years, involving locals, politicians and celebrity protesters such as Irvine Welsh, The Proclaimers and Jeremy Corbyn. A spokesperson for Drum Property Group told the Evening News that the retail or studio units will not be made available for occupation “in the meantime” and wants the site ready for construction. They added: “When we first took ownership of the site, we pledged to make these vacant premises safe and secure to prevent anti-social behaviour. “Many of the shopfronts along this section of Leith Walk have now lain empty for months, either because the occupiers have come to the end of their lease or they have ceased trading and moved out. “As we have consistently stated throughout our consultation with local politicians, groups and individuals, recovery of vacant possession at our property on Leith Walk is an essential step in the ongoing development process as we continue seek to transform our site in line with the aspirations of the City of Edinburgh Council.